Is there a better alternative to ES Image Printer Driver? 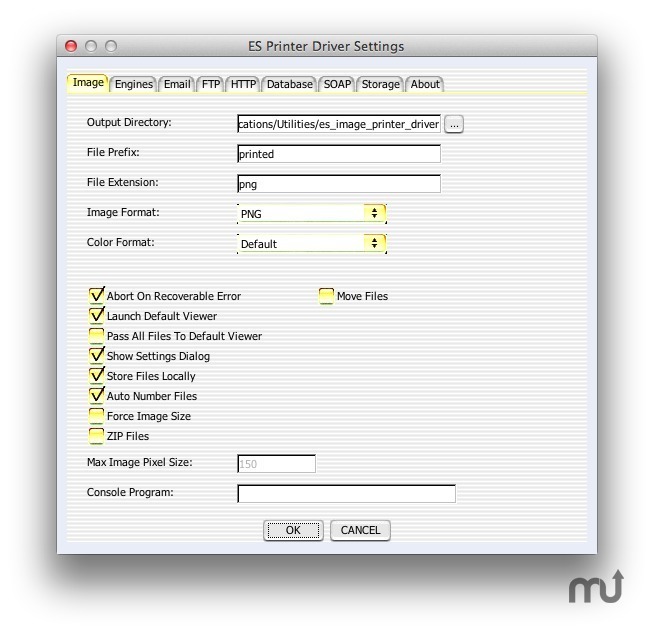 Is ES Image Printer Driver really the best app in Printers category? Will ES Image Printer Driver work good on macOS 10.13.4? ES Image Printer Driver is a software printer-driver that is accessible from any program that can utilize a Windows or OS X (Lion, Snow Leopard, or earlier) CUPS printer. Images are produced from the driver and stored on a specified drive and location with incremental numbers. ES Image Printer Driver needs a review. Be the first to review this app and get the discussion started! ES Image Printer Driver needs a rating. Be the first to rate this app and get the discussion started! The Windows driver is capable of printing 24-bit color images, as well as 1-bit black and white (binary) at 100, 200, 300, and 600 DPI either portrait or landscape. The Mac OS X version always prints in color mode (non PDF images are approximately 200 DPI). It is flexible and supports several image file formats such as PNG, BMP, JPEG, TIFF, Multi-Page TIFF, PNM, JPEG 2000, GIF, Animated GIF, and PDF. The driver also contains an engine that can allow a user to import images, as though they had been printed, from a directory using a navigation dialog.